Over the last two weeks I increased my prednisone dose from 8mg to 12mg because of a bad flare. The pain and fatigue just came on…no warning. I stopped climbing, I even found it difficult to brush my teeth, get out of bed and feed the dogs. All the side-effects of the steroid came back like clockwork. I got insomnia and some anxiety. The sharp increase also came with the feeling of inflammation around my lungs and heart. So, after five days on 12mg I tapered back the dosage as much as I could. I’m still not feeling great on that lower dose so I decided to have a relaxing Friday night stay-cation. So, what does a 23-year-old with a RA flare do to keep herself busy on a Friday night? 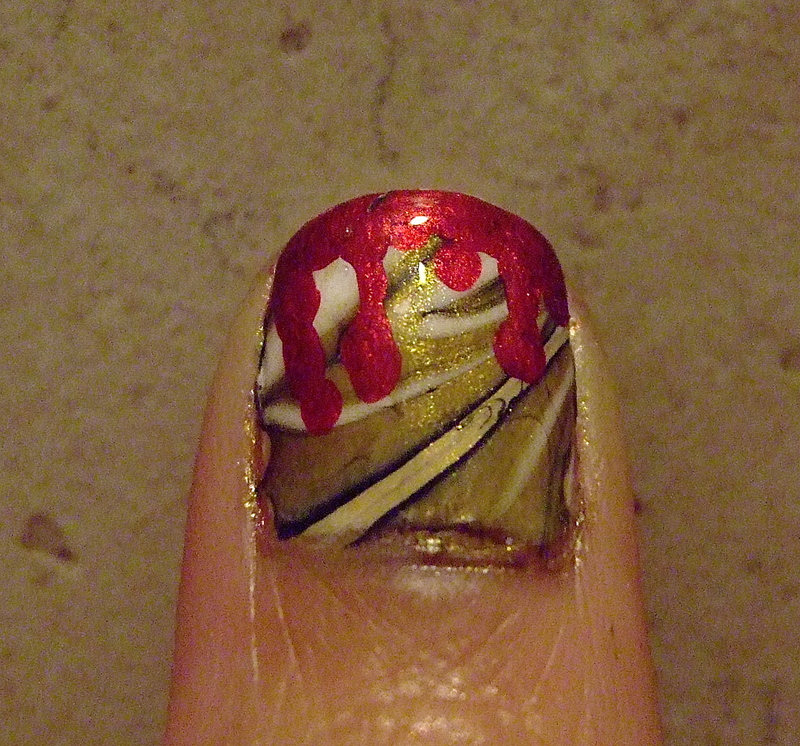 In preparation for my first live performance of “The Rocky Horror Picture Show” I decided to design a nail art for the occasion. 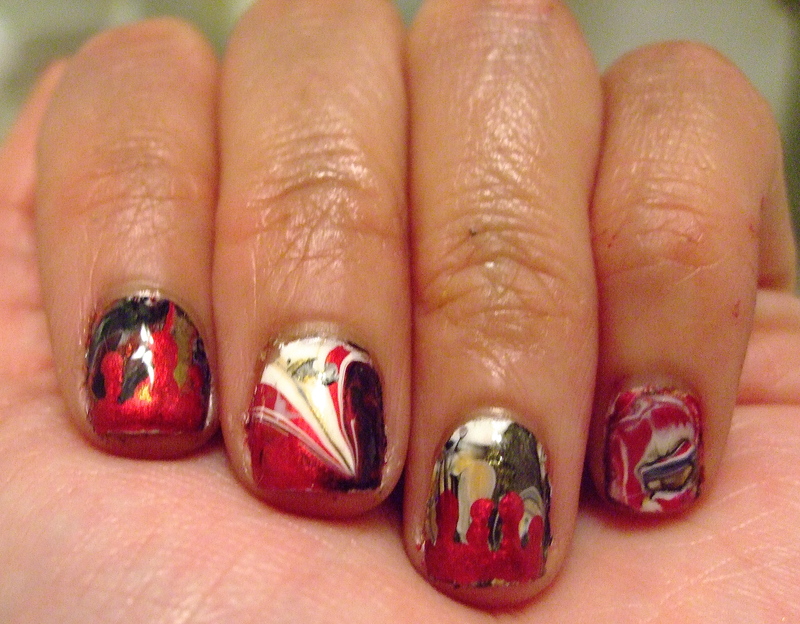 I water-marbled most of my nails and left one accent with a red-lip stamp. I also did a red-drip on the tips. 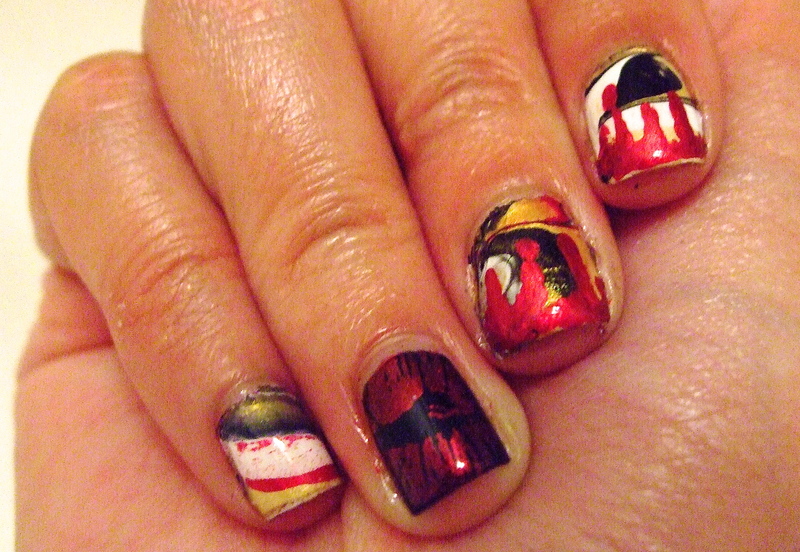 The nail polishes I used: Essie’s “Blanc”, Butter London’s “Knees Up”, Wet n Wild’s “Black Crème”, and Zoya’s “Goldie”. I apologize for the messy clean-up. I am still getting used to lighting and good angles but the colors are pretty accurate.